Subscribe to get deals from hundreds of merchants including the best of Expedia.com.sg! Expedia offers 10% off hotel bookings with Citibank credit cards. The promotion is valid until 31 December 2019 for bookings and until 31 March 2020. Get the deal to enjoy to enjoy the offer.. Please always check with the merchant on the validity of the promotion before purchase. This promotion is valid until 31 January 2020 for bookings and for stays until 31 April 2020. Enter the promo code at the checkout to get the offer. Valid only when you use your OCBC credit card.. Please always check with the merchant on the validity of the promotion before purchase. Expedia offers 10% off hotels bookings with HSBC cards. The promotion is valid for bookings until 31 December 2019 and valid for travel until 31 March 2020. Enter the promo code at the checkout to get the offer.. Please always check with the merchant on the validity of the promotion before purchase. Expedia 10% off hotel bookings with Standard Chartered cards. The promotion is valid until 31 December 2019 for bookings and until 31 March 2020. Enter the promo code at the checkout to get the offer.. Please always check with the merchant on the validity of the promotion before purchase. Expedia 10% off hotel bookings with Maybank cards . The promotion is valid until 31 December 2019 for bookings and until 31 March 2020. Enter the promo code at the checkout to get the offer.. Please always check with the merchant on the validity of the promotion before purchase. Expedia offers 10% off eligible hotel bookings with DBS cards. The promotion is valid until 30 April 2019. Enter the promo code at the checkout to get the offer.. Please always check with the merchant on the validity of the promotion before purchase. This promotion is valid until 31 March 2019 for bookings and for stays until 31 March 2020. Enter the promo code at the checkout to get the offer. Valid only when you use your OCBC credit card.. Please always check with the merchant on the validity of the promotion before purchase. Expedia offers 10% off hotel bookings with American Express. The promotion is valid until 31 December 2019 for booking and until 31 March 2020. Enter the promo code at the checkout to get the offer.. Please always check with the merchant on the validity of the promotion before purchase. Expedia offers 10% off hotel bookings with CIMB cards. The promotion is valid for bookings until 31 December 2019 and until 31 March 2020. Enter the promo code at the checkout to get the offer.. Please always check with the merchant on the validity of the promotion before purchase. This promotion is only available on participating hotels for bookings made between 15 January 2019 and 31 December 2019, for travel between 15 January 2019 and 31 Mar 2019, unless otherwise sold out prior. Save on participating properties with savings as marked.. Please always check with the merchant on the validity of the promotion before purchase. Daily deals change daily at 12am.. Check this page daily for new deals.. Click on link to find out more.. T&Cs apply. Please always check with the merchant on the validity of the promotion before purchase. Expedia offers unreal deals when you book flight and hotels together. The promotion is ongoing. Get the deal to enjoy the offer.. Please always check with the merchant on the validity of the promotion before purchase. Valid only for hotel bookings.. Special deals only apply to members.. No promo code required.. T&Cs apply.. . Please always check with the merchant on the validity of the promotion before purchase. Expedia offers 10% off hotel stays worldwide with UOB cards. The promotion is valid for booking from now till 31 March 2019 for stay from now till 30 June 2019. Enter the promo code at the checkout to get the offer.. Please always check with the merchant on the validity of the promotion before purchase. 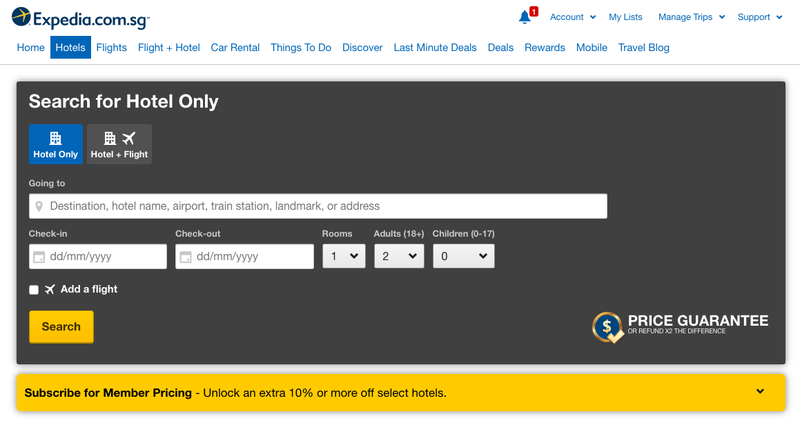 Expedia offers additional 10% off Hotel bookings with Citi cards. The promotion is available until 31 December for bookings and for travel until 31 March 2019. Get the deal to enjoy the offer. T&C apply. Please always check with the merchant on the validity of the promotion before purchase. Expedia offers 12% off on hotel bookings + 1000 Expedia Rewards points for your first booking with MasterCard. The promotion is valid until 30 September 2018. Get the deal to enjoy the offer.. Please always check with the merchant on the validity of the promotion before purchase. Expedia.com.sg offers up to S$200 Voucher when you purchase tickets on any airline with UOB Cards. The promotion is available until 25 October 2017, or whilst redemptions last. The voucher is valid within 30 days from receipt of Voucher. T&C apply.. Please always check with the merchant on the validity of the promotion before purchase. Expedia.com.sg offers 15% Off Hotel Bookings.Valid for bookings by 28 February 2018 and for travel by 30 August 2018. Enter the promo code at the checkout to get the offer. T&C apply.. Please always check with the merchant on the validity of the promotion before purchase. Looking for the latest Expedia promo code or credit card promotion for discounts on Expedia flights and hotels booking? Bookmark this page as we bring you the latest OCBC, HSBC, DBS, UOB, Citibank Expedia promo codes for Singapore. WHY BOOK ON EXPEDIA SINGAPORE? Do you want fast and reliable travel booking services? Do you fancy going on a vacation without jostling with crowds at a ticketing office or airline counter? Perhaps you wish for a place where you can book your travel itinerary – flights, hotels, and tours altogether. Or maybe you want cheaper alternatives to traditional travel agencies’ expensive rates? 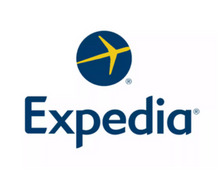 In comes Expedia, the world’s multi-awarded full-service online travel agent! Expedia.com.sg is one of the many auxiliary brands of Expedia, Inc. in Asia. Expedia is one of the world’s leading online travel agencies that revolutionise travel through the power of technology. Across the globe, their family of brands make travel much easier for millions of people who want to step out of their homes and into the world. They offer the best travel packages for an enjoyable vacation without bursting wallets. Founded in 1996, Expedia has since powered the best travel brands in the world - to be independent, innovative, and fast. This international services company operates in over 30 countries in 5 continental regions: Asia, Australia, Canada, Europe, and Mexico. Expedia encompasses brands that deal with every aspect of researching, planning and booking travel. Choose the best airplane seat, read personal travel reviews of hotels and plan your activities before you arrive at your destination with Expedia. It has exclusive brands, auxiliaries and partnerships with several successful companies to make travel-planning more convenient for its users. With Expedia, both leisure and business travellers can be assured of quality travel services with tastes and budgets ranging from modest to luxury. The list of travel-related brands above give an insight on Expedia’s focus to make the travel industry its niche, and give users like us more assurance that our travel bookings with them are well taken care of. Travel service aside, Expedia and its brands have been recognised and praised for its favourable work culture for employees. This includes their respect for diversity in the workplace and all-for-one, one-for-all team dynamics. Such a positive working environment also lead to an increase in confidence in the company as a whole. Your vacation is now at your fingertips. Choose from over 435,000 hotels and thousands of exciting holiday tour packages all over the world. Enjoy localised promos within Singapore with reliable and responsive customer support 24/7. Expedia is ready to help you with your vacation bookings at any time, from anywhere. With Expedia Singapore’s exclusive Best Price Guarantee, you can get the lowest possible rates stand-alone hotels and flight-plus-hotel packages. That extra saving can offset the other expenses of your trip! Expedia Singapore can help every traveller arrange cars, cruise trips, and even buy travel insurance. You can also read independent travel reviews, check your holiday destination’s weather forecasts, maps and 360-degree virtual tour of hotels to help you make more informed decisions. BARGAIN DEALS AT UNREAL LEVELS! In the spirit of Expedia’s relentless focus on value-laden services, affordable but always top in quality, the Expedia.com.sg website offers several worthwhile bargains for every destination you want to scale in your travel itinerary. What’s more, Expedia ensures customers with no cancellation fee to change or cancel almost any hotel reservation. Expedia Singapore prides in daily deals, flash deals and occasion-based bargains that can be redeemed with exclusive Expedia discount codes, or through the Expedia mobile app. Stay updated with Expedia’s promo codes with Cardable. When you choose Expedia, you can customise your own vacation or choose from a selection of time-tested ready-made packages. With just a click, you can buy flights and hotel accommodations at the best affordable rates. Save more when you book in the holiday packages option – you can enjoy a vast variety of activities, services, and attractions in your chosen destinations! Plan your perfect holiday vacations with Expedia Singapore! Search for flights, hotels, car rentals, activities or services you want wherever your next travel bug may bring you. Use Expedia.com.sg’s exclusive Discover and see independent reviews features to guide you in choosing your destination and the activities you might want to do during your vacation. With the wide selection Expedia offers, you may even get inspiration for your next holiday spot while planning for the current one! If you can get a good bargain with the deals and promotions, that will be an irresistible offer almost impossible to reject! 1. Cardable updates regularly and helps you to get the best deals and promo codes, so bookmark our page and visit us often to browse our latest coupons. 2. Go to Expedia.com.sg with any of our selected deals - sign up or log in and make a booking! 3. While booking, plan the rest of your itinerary – flights, activities, transportation services, etc. This way, you can get more savings in booking by bulk. 4. Provide your payment and contact details during booking – such as your credit card data and your mobile phone number. 5. Choose the most suitable payment option for your planned getaway. If you want discounted rates, pay immediately. 6. Look for the drop-down menu in the payment section, then slide to the bottom of the page and click “complete booking” banner. 7. Type discount code you’ve chosen above the “Apply Voucher” button. You’re done – all you have to do is to receive the confirmation message and your booking details via email and you’re all set to make the best of your vacation! TRAVEL NOW WITH EXPEDIA SINGAPORE! You no longer need a travel agent or a travel site to prepare for that last minute business trip or leisure travel. Fancy going on a last minute trip to the Philippines, Indonesia, South Korea, or Japan? Keep a lookout for last minute deals with offers for tickets or flights within the week. Accommodations – hotels of any kind and quality level - are also just as accessible on Expedia. So, what are you waiting for? Go to Expedia Singapore’s website and get your dream vacation with the best savings for the most comfortable accommodations and tour packages! Best of all, with the latest Expedia promo code or credit card promotion for discounts on Expedia flights and hotels booking as well as the OCBC, HSBC, DBS, UOB, Citibank Expedia promo codes on Cardable Singapore, you can look forward to some great savings as you travel the world!